Recently, there has been a significant rise in the use of online learning. In the last five years, businesses, governments, and even universities have spent a huge amount of money, time, and resources to obtain and implement online learning tools. This infographic puts the elearning industry into perspective. Investment in online learning is on the rise, and is becoming a best practice for corporate training. Some of the reasons for this are that that it is inexpensive, accessible, and standardized. With all the enthusiasm surrounding online training, it is easy to forget that there are some serious drawbacks to compulsory online courses. Specifically, it is difficult to motivate employees to complete online courses, and sustaining the skills learned is not always easy. Luckily, there are some easy ways to combat employee apathy when it comes to compulsory online courses. Motivating employees to learn the skills that eLearning courses impart sounds difficult. In reality though, encouraging people to engage with the material presented in these courses is remarkably easy if the right learning environment is provided. 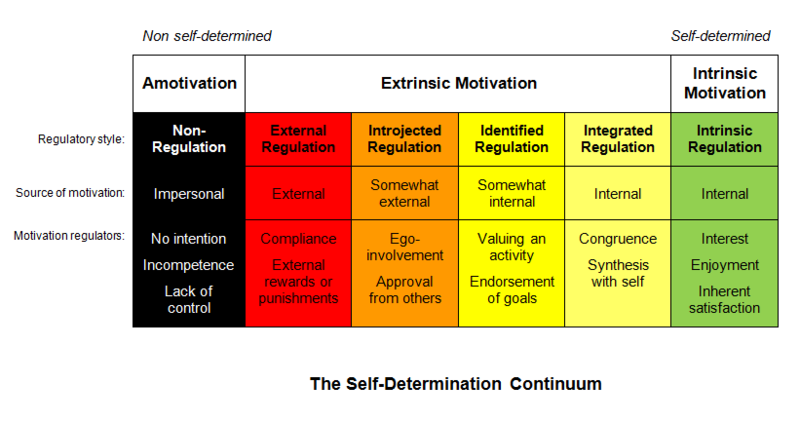 Framed in terms of Self Determination Theory, constructing a good learning environment is fairly intuitive. Creating a leaning environment that meets these needs will increase motivation, even when eLearning is compulsory. Better yet, it will empower the learner to engage with the material and take away useful skills. As much as possible, give people the ability to tailor the course to their individual needs and their existing skill set. For example, give them the option to skip modules that they might already be familiar with. Choices with real consequences make the experience more meaningful and can empower the learner to pursue personal goals. Provide a reward system based on the number of challenges completed rather than screens visited. It also helps to increase the difficulty with each success so that the individual has a sense that they are making progress rather than grinding away. It may help to use branching scenarios with meaningful consequences for the decisions that are made. Discussion areas and spaces to share ideas, resources, and ask questions promote feelings of connectedness and can promote the growth of understanding and new ideas. Collaboration also provides a supportive space for those who might be struggling. Give people multiple opportunities to practically apply the skills they have learned. Ensure that they have access to the relevant tools and support, and ensure that adequate time is provided. Practice time would be an excellent place for further collaboration to reinforce skill sets. No one likes to feel like they are running to stand still, so to speak. Providing regular, constructive feedback gives the impression of progress and achievement and ensures that difficulties are addressed before they become problems. So, let us assume that these tools have been put to use, and the motivation level to complete an online course is high. The next obstacle is often ensuring that changes arise from online courses. Online learning can promote a “checkbox” approach to leaning. An online course is often treated as a minor irritation that has to be completed so that things can return to normal. Ensuring that a new skill set is sustained ensures smooth operations, but requires some effort after the course is completed. People must be provided with the social tools, collaboration, and support to sustain and practice their skill set. Motivation and learning are intimately connected, and promoting motivation will lay the groundwork for maintaining a level of competency and skill, which is good news for everyone. My name is Matt Guyan and I’m an enthusiastic learning professional from Newcastle NSW, Australia. I’ve been working in the learning and development field since 2007. I started out as a classroom facilitator and workplace assessor then more recently I moved into instructional design specialising in creating eLearning using Articulate Storyline. I have a keen interest in human cognitive architecture and motivation as well as being an advocate for performance support, informal learning and community building using social media. I’m currently completing a Master of Education in Educational Psychology at the University of NSW.